Who was Black Hawk and why was this Native Indian chief famous? Summary: Black Hawk (c. 1720 – 1769) was a famous Native Indian chief and war leader of the Sauk and Fox American Indians. He led a brief conflict, called the Black Hawk War fought in 1832 between the United States and the Sauk and Fox Native Indians. The following fact sheet contains interesting facts, background history and information about the life of Black Hawk and the events in history that led to his fame as a great Native American Indian leader. Black Hawk may have been born into one of the regular families within the Thunder Clan of the Sauk. The two small nations of the Sauk and the Fox tribe had lived as one family for a long time and shared the Algonquian language. Their lands streteched from the northern Great Lakes to the Mississippi River, and down to Illinois and Iowa. Their number was not more than six thousand. Black Hawk was born at Saukenuk which was the principal Sauk city located just along the Rock River. His father’s name was Py-e-sa, a respected medicine man. Black Hawk was a member of the warrior class which were highly regarded in their tribe. He was able to kill his first opponent at the age of 15. This allowed him to wear war paint and feathers with permission of his tribesmen. Time and again he was able to prove his bravery and his prowess in battle through constant clashes they had with neighboring tribes which threatened the Sauk and Fox tribes. In 1812, he sided with the British in the War of 1812 with the hopes of driving the invading Americans away from their land. The group of Native Indians that he was leading was highly recognized among the ranks of the British Army and highly trusted. This may have been the result of several battles that the group won. In fact, the win over at Campbell’s Island and the Credit Island was associated with the group led by Black Hawk. There was however a point in time where he retreated back home as he grieved in the number of Native Americans who died during the War of 1812. However, when he knew that his rival became a member of the war council, he went back to the British war front and helped them win eventually. Reports have been made that Black Hawk rode with the British Band through the Great Sauk Trail receiving gifts from British settlements every year. 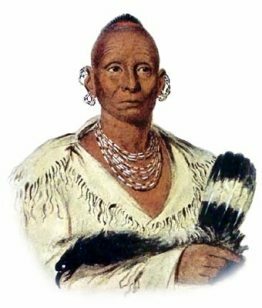 Black Hawk married after the War of 1812 to Singing Bird and although polygamy was being practiced by their tribe, he only had one wife. Back in 1804, the American government had an agreement with those that came before Black Hawk that the Native Americans are allowed to stay in their lands. However, the catch was the time limit of 24 years. It was the time frame in which the treaty was effective and Black Hawk reportedly did not know about this clause. Early in April 1832, he attempted to return to Illinois. General Henry Atkinson discovered that Black Hawk had crossed the river with more than 1000 Sauk and Fox Native Indians. This action was a migration but the government viewed it as an armed invasion, General Henry Atkinson and the American settlers viewed the movement as hostile, and on April 10, 1832 the Black Hawk War began. Black Hawk defeated the brigades of militia on May 14, 1832 and won several other minor skirmishes. However, the situation soon changed and Black Hawk's warriors were defeated August 2, 1832, at the mouth of the Bad Axe in Wisconsin. Black Hawk surrendered at Fort Crawford, and the Sauk tribe formally ceded all their lands to the United States of America. Black Hawk became a famous prisoner of war and was presented to the different nations in the United States and in Europe. After his release he lived in Iowa, dying there October 3, 1838.
and give you more trouble before I surrendered." For additional facts and information refer to the legend and the:.